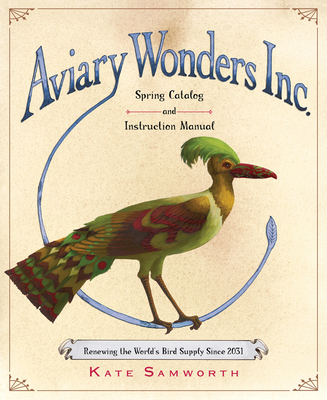 Since 2031, Aviary Wonders Inc. has offered bird lovers a unique opportunity: Assemble your own bird from stunningly beautiful and carefully hand-crafted parts. The birds can even be taught to fly and to sing! This slyly satirical crafter's delight is offered as the perfect antidote to extinction of birds in the wild. Brilliantly illustrated with oil paintings and filled with laugh-aloud asides as well as sobering facts about extinct species, this mock catalog is a clever send-up of contemporary sales spin and a thought-provoking look into an all-too-possible future. Kate Samworth studied (and taught) painting at the New Orleans Academy of Fine Art and printmaking at the Philadelphia Academy of Fine Art, where she took an illustration course with David Wiesner. She lives on a farm in Stanardsville,Virginia, teaches and paints at a studio in Charlottesville, and travels widely.She is an ardent spokesperson for environmental protection and preservation. "This futuristic mail-order catalog offers hand-crafted parts for ambitious do-it-yourselfers who want to assemble a customized bird. . . The ecological subtext will resonate with some environmentally concerned children and adults who hope such a catalog will not become a necessary reality." "For children and their bird-watching parents, who will appreciate the clever premise and the message of admiration." "This is an original, somewhat disturbing, and wholeheartedly bizarre (but in a good way!) picture book for older children. . . An impressive picture book debut." "This is as cleverly executed as it is edifying...The gilding-the-lily exaggeration of birds’ natural beauty is satire at its child-appropriate best, and the subtle digs at our perennial efforts to domesticate animals for our pleasure won’t be lost on young readers."